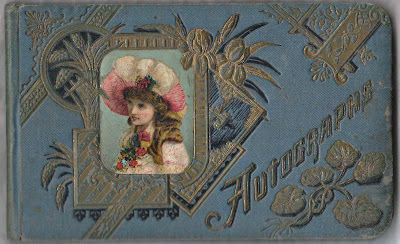 1880s and 1890s autograph album with signers mostly from New Hampshire and Vermont. The album is approximately 7" x 4-1/4" and contains 36 signed pages. An alphabetical list of the signers appears at the end of this post. I purchased the album several years ago from a seller who assumed that the original owner was the first signer, Abbie E. Parker of Wentworth, New Hampshire. 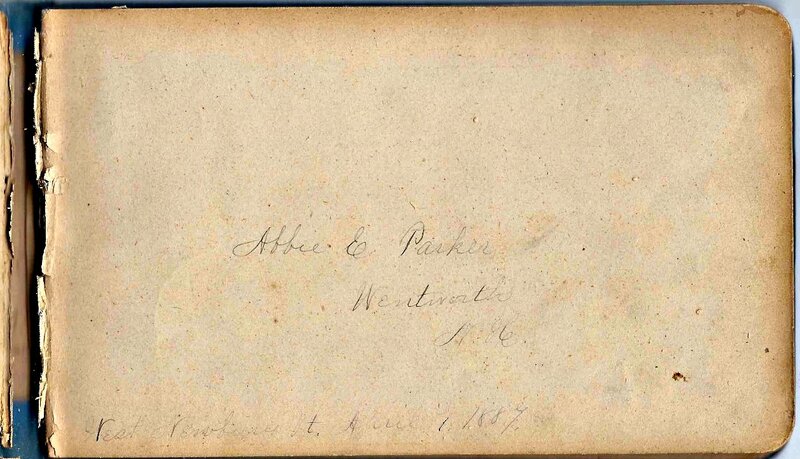 Since one or more of the first pages is missing, including the title page, however, it's very possible that Abbie was not the owner. 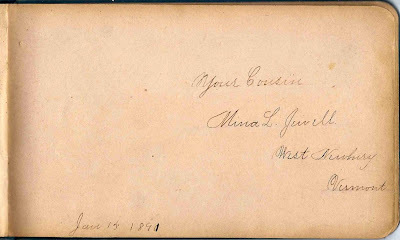 Two signers were sisters Addie Viola Jewell and Mina L. Jewell of West Newbury, Vermont, who signed separate pages on 15 January 1891. They indicated that they were cousins to the album owner. Additionally, Addie indicated that she and the owner were schoolmates, so they were about the same age. 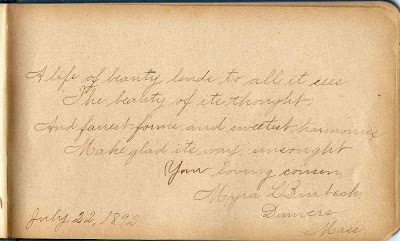 Cousin Myra L. Burbeck of Danvers, Massachusetts, signed a page on 22 July 1892. Perhaps a reader who figures out the album owner's identity will leave a comment or contact me directly. Two people identified themselves as the album owner's teacher. 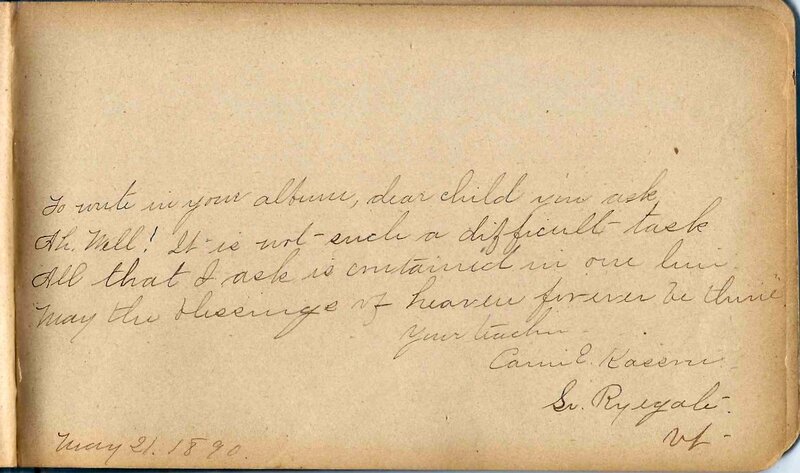 Teacher Carrie E. Kassen of South Ryegate, Vermont, signed a page on 21 May 1890. 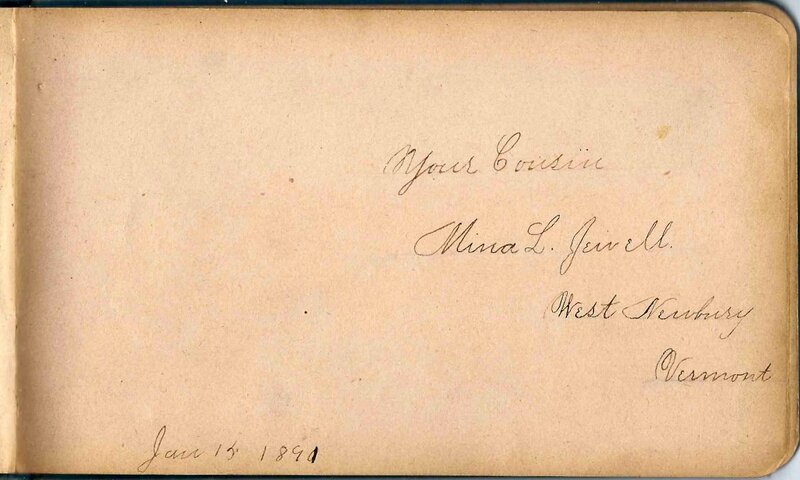 Teacher Millie S. Bancroft of Rome, Michigan, signed a page at Newbury, Vermont, on 18 September 1891. 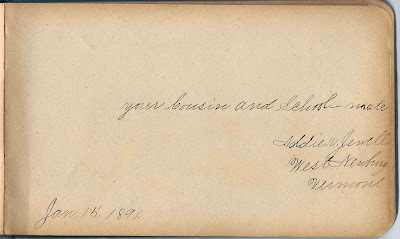 Mary E. Smith of South Newbury, Vermont, signed at West Newbury, Vermont, on 22 June 1892. "Dist. No. 1." I thought it would be easy when I found many of the signers in these two trees at rootsweb, but not so. I couldn't find anyone in the trees who was a first cousin both to the Jewell sisters and to Myra Burbeck. The owner could have been someone not included in either tree. The families in the area seem to have been interrelated. But if second cousins are allowed, I would a wild guess and say the owner was Luthera M Carleton, born 3 Dec 1880, died 3 Jun 1956, who later married Fred Wilcox. One big problem with this theory is that there are no Carletons among the signers. She is the daughter of Dudley Carleton, born 13 Aug 1845, and Martha A Jewell. In 1940 she and Fred Wilcox were living in Lebanon, NH. They were still there in 1954, at 31 Crafts Ave. She was a teacher on one of the censuses. Luthera is a first cousin to signers Addie V. and Mina L Jewell, who were daughters of George Jewell (1840-1882) and Elizabeth Brock (b. 1844). But only a second cousin to Myra Burbeck. If I am correct, this following lady, Hattie Willerton, is the clue, since she was from out of town. Who was she visiting, and why was she in the area? In 1895 Hattie C Willerton, of Rock Island, Illinois, signed the autograph book. Hattie's maiden name was Carleton. Signer Myra Burbeck is Hattie's first cousin, once removed. Hattie is also Luthera M Carleton's first cousin, once removed. Hattie Willerton's father, Dudley B Carleton, was born in 1820 in Vermont, but lived for the longest time in Davenport Iowa. 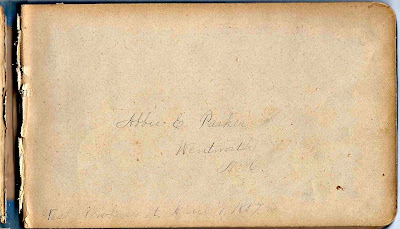 His wife, Ruth D Huckins, died 9 Sep 1891, unknown where. In 1900 Hattie's father Dudley was living with Luthera M Carleton's father Dudley, who was the elder Dudley's nephew. I'm guessing that in 1895 Hattie (Carleton) Willerton was bringing her father back East to be cared for by relatives in a position to do so. 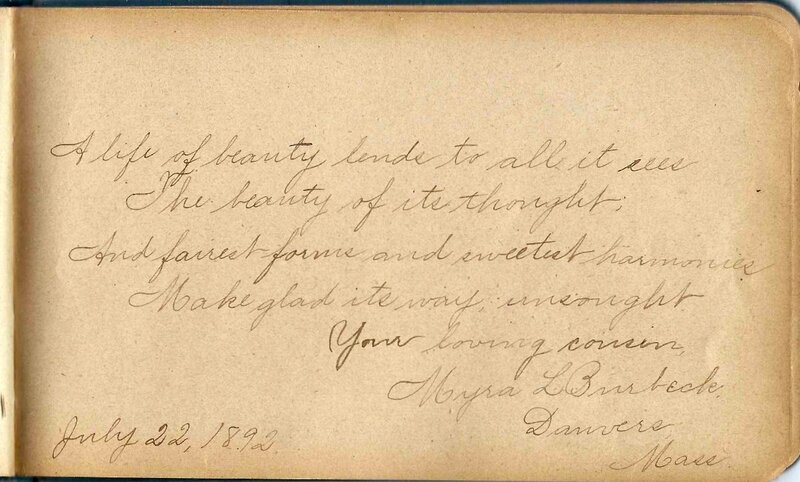 Luthera was in her father's household, and Hattie signed her autograph book while in Vermont. Great detective work, Ed, and I especially enjoyed Luthera's photograph and the information about Hattie (Carleton) Willerton and her visit back east. I'm amending the post to refer readers to your comment. It's so discouraging when you find pages missing from these albums, especially those at the beginning. But this one gave you a nice mystery to unravel! 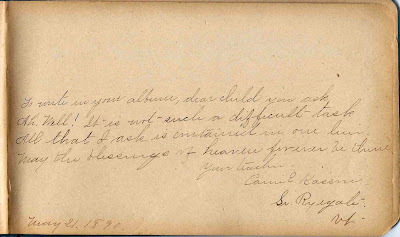 Albums with lots of pages signed by family and neighbors are special treasures! And it seems that this album is one of those, thanks to your research, Ed. I hope a family member happens upon this trove! I recently acquired a large stockpile of very similar family heirlooms, diaries and letters, photos and bibles associated with my husband's ancestors who lived in this same area, so I was hoping for a connection to your find. Alas, none apparent. Good luck with your search. It would make my day if someone contacted me with such a treasure from days long gone.